So, I was really excited to hear of her comeback – especially that this time it wouldn’t just be one song but an entire EP, Invitation (the First Mini Album). I don’t understand why a lot of Korean artists label their albums in chronological order but that’s irrelevant I guess. Ailee made a comeback this week and I’m excited to review her first stage on Music Bank with I’ll Show You! I loved this stage! I loved how the start was completely different to most of the stage. I thought Ailee looked so beautiful at the start. She looks very cute with braided pigtails. Sitting on the stairs with lights on the floor like stars? So pretty! It looked like she was sitting by a lake at night time and lit by moonlight (am I going overboard here \(-_-);;) – so pretty! And then the beat kicks in and quite literally like the lyrics to the song, she’s transformed into a Glamazon with a capital G. Amazing! Ailee looks so hot in her tight gold sequin dress and the red military jacket really gives her an editorial edge. As everyone knows, red is definitely the in colour this season! I also really enjoyed the lights and screen on the stage floor – it gave the performance an added layer of complexity that not all stages have. Whilst I thought the dancers got in the way a bit, I thought it was a good stage. And let’s not forget fireworks! I wish every stage had fireworks in it! I thought Ailee’s dancing skills have really improved since Heaven. You can tell that she’s been working really hard to be a true performer with a whole range of talents and skills. Ailee also showed off her charisma – she has this in spades! She really is super confident. I think some K-pop idols have a very unique star quality to them. They are beautiful, handsome, charismatic or super cute. I don’t think there are too many that have that Hollywood appeal (Jessica from SNSD springs to mind). But Ailee definitely feels like a star! She just oozes it. I mean, how many people do you know that look *that* confident on stage? Go Ailee! As with Heaven, I’ll Show You features some powerhouse vocal moments. No doubt about it, Ailee’s vocals are some of the best in the business. She may have the tendency to over sing/shout at times but when you have a voice like her’s that can be forgiven. I really think that Ailee has an exceptional voice. When she sings softly, it is so endearing. She can really express herself when she sings. But when she opens up and goes for those big notes – wow! 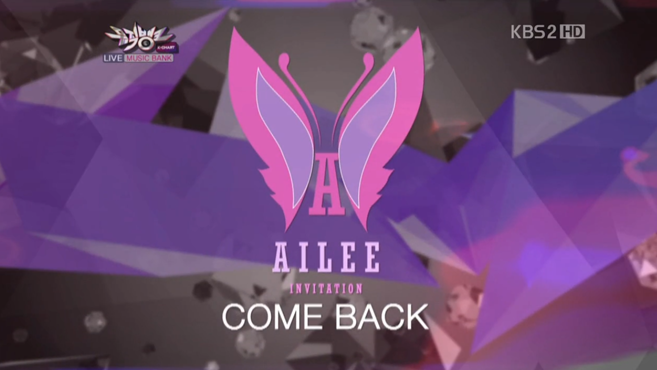 Ailee hwaiting!!! If you want to read the lyrics then check them out here! Ailee with fireworks performing I’ll Show You on Music Bank. Yay! Fireworks! The Overall Score for Ailee’s I’ll Show You on Music Bank is… 5 / 5 stars! Ailee – I’ll Show You on Music Bank 19th October 2012 – reviewed by K-pop Peach on October 20th 2012. I thought this performance was amazing! Everything was perfect, Ailee hwaiting!